When I was a young girl Halloween was a one day event mostly for children. It was a Jack O’Lantern glowing on our porch, and the aroma of pumpkin seeds toasting in the oven. It was being dressed up in odd (we thought) clothing found in the back of our parents closet. It was being out alone in the scary dark. It was bringing home a bulging pillowcase of candy. Things sure have changed. Reportedly Americans now spend over 3.5 billion dollars a year on Halloween. This weekend we turn our clocks back an hour as we return to Standard Time. When do we do this? Saturday night before going to bed or Sunday morning 2:00 a.m., whichever comes first. Does this mean we get to spend an extra hour at our favorite bar? No, bars do not stop serving liquor at 2:00 a.m., but actually at 1:59 a.m., one minute before the clocks are set back one hour. Those clever lawmakers. It is also a good time to change the batteries in your smoke detector(s). Some inexpensive detectors also need to be replaced completely about every five years. Dispose those old batteries and alarms properly. For the correct time of the day, you can call the Department of Transportation at 1-900-410-TIME. There is a charge for the call. This time of year always comes up quick and equally goes by just as quick. Halloween is tomorrow, whoa, where did that come from? I could have sworn there was at least another week. So today I scrambled around finishing up costumes and getting appetizers for a kiddie party we are attending tonight. Yikes. But I will admit it’s fun, and I love it! When I was working in the Corporate atmosphere, if Halloween fell on a weekday, I would head down to the local Cemetery on my lunch hour. There I would walk around in hopes something would pop up and scare me. Nothing or no one ever did. I always asked my co-workers to join me, and they said I was looney, “Eh, it’s all in the Spirit of the season” I said. I don’t do that anymore, that would mean having to bring my own little goblins with me, and chasing them around tombstones would probably make the Dead laugh at me, not try and scare me. But as soon as I deem my kids old enough, I plan to hand this tradition down. I just discovered today that a lot of newbie parents are still unaware of places you can take your kids besides the proverbial street Trick or Treating. Which is cool, unless the weather gets grisly. So here are a few local haunts that are hopping with family fun. Westgate Mall: Halloween Trick-or-Treat event –5:pm to 7:pm Westgate Mall’s annual Trick or Treat event located in Center Court, in front of Ross. Join us for trick-or-treating, live entertainment, balloon characters, arts & crafts and more! Plus, all children receive a FREE Westgate Mall trick-or-treat bag. Westfield Valley Fair: Dress up in your favorite costume and join Westfield Valley Fair for a safe evening of Halloween fun. Trick-or-treating will be from 5:00pm to 6:00pm at participating retailers and the Westfield Concierge. I want to mention also that many Community Churches are holding events though out San Jose, but I don’t have those actual website to list. I apologize! I’ll be happy to add them if you let me know! Otherwise, just give your local Church a call and ask if they have anything brewing for the kiddies! So go out there and have some fun! And be safe, for All Hallows sake! Posted in Community, Entertainment, Events, Family, Free, Fun, Holidays, Kids, San Jose, Silicon Valley | Comments Off on Boo! Happy Halloween! 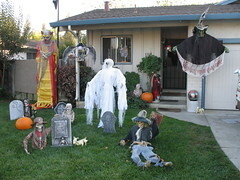 This house is ready for Halloween night. The best thing about fall and winter holidays is seeing your neighbors decorate. This house is along my way home from work, not really close to home, but still it feels like part of my community. I can see they’re ready to “treat” the neighborhood kids on Friday night. In my immediate neighborhood, the best Halloween decorations are at “the Haunting of Sixth Street,” where nine neighbors on the 300 and 400 blocks will present over-the-top decorations for trick-or-treaters. Complete with actors and sound effects, this area has been a highlight of Halloween night in the downtown area for several years already. Back when I was in High School, maybe even back in Junior High, there we the stories of the Niles Canyon Ghost. I cannot completely remember how the story goes, I was in a fog back then, but to this day, I do not want to travel Niles Canyon Road at night any time of year. There are various versions of the story. The story is that a young woman was killed in an automobile accident on February 26 along Niles Canyon Road. What varies is the year (20’s, 30’s, to the 40’s) and if it was her wedding night or that she had been to a dance in Sunol. Even though the accident was on February 26, this story is often told on Friday the 13th and around Halloween. In 2004 Victor Navorsky (Tom Hanks) gets stuck at JFK when he finds that he is a man without a country. You must have seen ‘The Terminal’. Could we have a similar situation going on right here at SJC? The first and second time that I saw her she didn’t seem all that out of place. She was pushing around a $3 Smarte Carte (baggage cart) loaded up with a couple of bags. Now its’ cargo has grown to include a couple of Styrofoam ice chests, and a tall tube-ish box which looked to have a drink cup dispenser attached to it. She now resembles a genuine homeless person. When she became aware of my interest she quickly held a newspaper up to cover her face, and darted out into the parking garage. She often pretends to be making a phone call or other ‘normal’ activity. An airport official told me that they were aware of her. Because SJC is a public property and until she becomes a nuisance there is not much that can be done. I wonder? Posted in Airport, Commentary, News, Observations | Comments Off on SJC "The Terminal"
The current BART extension plan calls for six BART stations in the South Bay. Six. Of those six stations, four are in San Jose and of those four stations only one is technically downtown. The downtown station will be located on East Santa Clara Street, between Market Street and 3rd Street. Another station will be located near the the Arena and the Diridon train station. Some say that area is part of downtown; I say it is a stretch. The other two stations are on the east side of San Jose, Alum Rock and Berryessa. The Alum Rock station will be located at East Julian & North 28th Streets, near 101. The Berryessa station will be located in the Flea Market area. The city wants to flatten the Flea Market and replace it with housing. Just think of all the people who would come down to the Flea Market from around the Bay Area to spend their money. But, no! Put in housing so those residents can take BART out of the area. There will also be a station in Milpitas (Montague/Capitol) near the Great Mall and there will be a station in Santa Clara near the Caltrain station. With these exciting San Jose station locations, where will we be going in San Jose? Could it be that there will be a great deal of ridership between the Alum Rock and Berryessa stations? Maybe downtown residents will hop on BART at the downtown station so they can go up to the Great Mall in Milpitas. The city will want to get those Shop San Jose posters up in the stations. I did not mention the really exciting news, the Santa Clara station will have an Automated People Mover system that would connect to the Norman Y. Mineta International Airport! Wow! Now everyone in the Alum Rock, Berryessa, and Milpitas areas can haul their luggage on BART and a people mover to the airport! The ease of it all. Wait a minute. The Santa Clara station would be on the west side of the airport and the terminals are on the east side of the airport. That Automated People Mover will cost a pretty penny to build/operate. So, you want to use BART to get the heck out of San Jose you say. Currently there are plans for 5,000 paid parking spaces with plans to increase that to 10,000 by 2030. VTA claims there will be over 100,000 riders (Yeah, right). Let us assume half that number will leave San Jose, how are they getting to one of the stations? Well, VTA would love for you to take one of their buses or light rail. However, will VTA be able to handle/afford the increased demand? Are you willing to spend most of your life on public transit? We could save money by forgetting BART and electrifying Caltrain for a great deal less money. Electrified Caltrain would be environmentally good and the trains would be faster (faster to SF than BART). Not to mention we would only have to pay for the Caltrain portion in Santa Clara County. Stuff to read: Transbay Blog, BayRail Alliance, and VTA. KFRC was home to Merv Griffin in the 40’s (swing music) and Dr. Don Rose in the 60’s (Top 40) when the station was on the AM dial at 610. The station has gone through a number of format changes over the years. CBS bought KFRC, leaving the AM dial ending up at 99.7 FM. More format changes with KFRC becoming Movin’ 99.7 playing dance music. About a year later CBS’ Free FM shock-talk format at 106.9 was dropped and 106.9 FM became the new home for KFRC playing a classic hits format. Got it so far? Try this. If you have not already heard, Monday the KFRC on-air staff was told that they were history; KFRC would start simulcasting KCBS all news broadcasts beginning Monday, October 27. This past season the A’s were on KFRC, it has been suggested that they helped lower the station’s ratings but were not at all the main reason for the poor numbers. Jumping around the dial and format changes did not help. Low ratings and KCBS wanting to expand its audience, younger listeners who hang out on the FM dial being a reason for the move. KFRC’s Classic Hits have not completely disappeared; the classic hits will continue to be available as streaming audio at KFRC.com and on KFRC-HD2; however, you will not hear Dave Sholin, Celeste Perry, Sue Hall, Jay Coffey, and Ben Fong-Torres. If this turns out to be a positive move for KCBS, will KGO and KLIV be next? Yesterday, high winds tried to keep the zeppelin in Arizona. Today the 246-foot airship appeared in the sky over Blythe, California. At last look they set down in San Bernardino. While in San Jose for the Steampunk Convention, Abney Park (“The Airship Pirates”) will go up in the airship. Tickets for the ride are Sold Out, but tickets for the Steampunk Convention seem available.